Discover a restaurant born from a family’s desire to re-create an authentic Texas taste. Glenn Raddatz, co-founder of The Texan BBQ, 101 N. Main St., Algonquin, always loved the taste of good barbecue. Thus, The Texan BBQ opened its doors in 1984. The sit-down/carry-out restaurant features mouth-watering barbecue delights, including ribs, pork, beef and chicken. The business also offers chuck wagon catering for rehearsal dinners, pig roasts, company picnics and other special events. Sadly, Glenn died in 1999, at age 46, after a sudden illness. Roxy, a former hairdresser, knew what she needed to do. 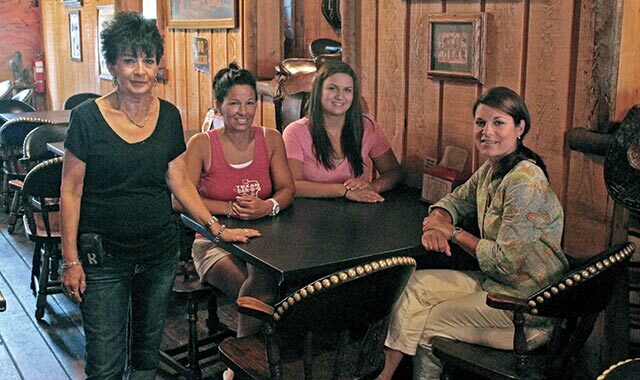 She kept her husband’s legacy alive by hanging onto the restaurant, thanks to help from daughters Jessica, Denise and Shelly, who also work there. The restaurant employs a staff of 15. The Texan BBQ is a highly regarded staple in the Algonquin restaurant scene. It consistently has been voted one of the best barbecue joints in the Fox Valley, and has hosted fundraising events for a variety of causes, from fighting cancer to supporting police and fire departments. The Texan BBQ menu is filled with entrees such as hickory-smoked ribs, spicy Cajun chicken and farm-raised catfish. The most popular dishes are beef brisket, sliced and pulled pork, and baby back ribs, which are fall-off-the-bone tender and smothered in a rich, smoky sauce. The garlic mashed potatoes are bold, and the coleslaw is creamy and tangy. The list of homemade desserts includes chocolate cake, cheesecake and Key lime pie. The restaurant décor complements its Texan cuisine. The main dining room has wooden booths, tables and floors, and enough space to seat 100. Two back dining rooms can hold receptions, reunions and birthday parties. A small bar offers beer, wine and mixed drinks. Hungry customers flock to The Texan BBQ from Lombard, St. Charles, Crystal Lake and even Lake Geneva. “We have regular customers, some who come in as many as three times a week,” Roxy says. Gene Maczko, an Algonquin carpenter, has been a regular since 2005. He once met a friend here for lunch, and has been a frequent guest ever since, stopping in at least twice a week. He typically orders the prime rib sandwich, but barbecue ribs are his favorite. The Texan BBQ is open Sun.-Thurs. 11 a.m.-9 p.m., and Fri.-Sat. 11 a.m.-10 p.m. This entry was posted on Wednesday, July 31st, 2013 at 11:59 am	and is filed under Dining Guide. You can follow any responses to this entry through the RSS 2.0 feed. Both comments and pings are currently closed.